Borders of states, borders of citizenship, borders of exclusion. As the lines drawn on international treaty maps become ditches in the ground and roaming barriers in the air, a complex state apparatus is set up to regulate the lives of those who cannot be expelled, yet who have never been properly ‘rooted’. This study explores the mechanisms employed at the interstices of two opposing views on the presence of minority populations in western Thrace: the legalization of their status as établis (established) and the failure to incorporate the minority in the Greek national imaginary. Revealing the logic of government bureaucracy shows how they replicate difference from the inter-state level to the communal and the personal. 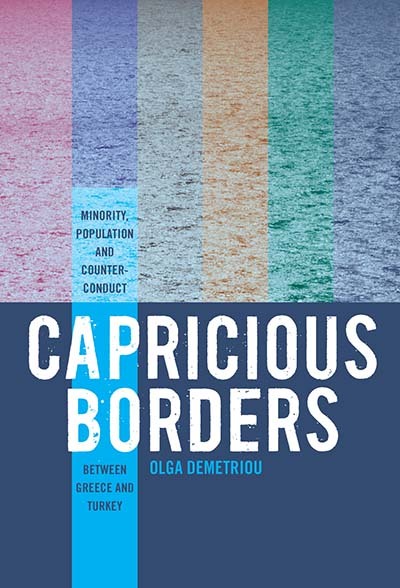 Olga Demetriou is a social anthropologist based at the Cyprus Centre of the Peace Research Institute Oslo and teaches at the University of Cyprus. Apart from Capricious Borders she has also authored Refugeehood and the Post-Conflict Subject and co-edited, with Rozita Dimova, The Political Materialities of Borders.